Do your kids absolutely love Angry Birds? If so than you are going to adore these totally awesome Angry Bird Crafts and Activities! Angry Birds have been incredibly popular for several years now and are still all arise! Kids of all ages just love the funny faced birds and pigs that they can throw things at and watch them fall down or explode. These 25 Awesome Angry Bird Crafts and Activities are perfect for your next themed birthday party, classroom activity or whatever get together you may have planned. With these totally awesome ideas you can smash, throw, eat, sip, wear and even disguise yourself with Angry Bird madness! Have fun! These Angry Bird Oreo’s not only look adorable they are absolutely delicious! Your kids are definitely going to want to play with their food when they get these tasty cookies! Surprise your kids with this super fun Angry Bird Pizza creation. The kids are sure to demolish this pizza in just minutes! SMASH those pigs when you play this cool game of Angry Bird Bowling! Whether you are decorating for a party or looking for some fun ideas for your kiddos new Angry Bird room design these Angry Bird Letters are perfect! The kids are sure to go CRAZY over these totally cool Angry Bird Bean Bags and Sling Shot! Check out how you can make them yourself with just a few easy steps. Knock them all down with this Life Sized Game of Angry Birds. With just a few boxes, balls, and balloons, you can build them up and knock them down. Design your own Angry Bird Balls and watch as the kids faces light up! You can use them to throw at your own set up or to just enjoy playing ball. Either way the kids are bound to love them! Beware of the dynamite! This Dynamite Garland is so much fun and is perfect for hanging over your snack or gift table. These Angry Bird Book Markers are such a neat craft. Make them during an art lesson at school or as a craft activity at your next party! Get creative with these fun Angry Bird Book Corner page markers. These book markers will add a little extra fun to reading for your kiddos. Keep the party going with this fun game of Angry Bird Bowling. This game is so fun it is sure to keep the kids entertained for hours. Send the kids home with the coolest party favors ever with these fantastic Angry Bird Pails! These Angry Bird Cardboard Tubes are fantastic for filling with snacks or craft accessories for your next party. Give your table a POP with this awesome Catapult Centerpiece. Give the kids the disguise of their lives with this awesome Angry Bird Felt Mask. Have some origami fun with this awesome easy to follow Angry Bird Folded Paper tutorial. Sweeten those kiddos up with Red’s Oreo Pops. The kids are sure to love these adorable treats. Make these 3D Angry Birds as centerpieces for your party table or use them as an advanced craft for your older kids. This Angry Bird Paper Plate Craft is such an easy activity to pull together in a pinch. The kids are sure to love this painting craft. Give those plain old party hats a fabulous new look. 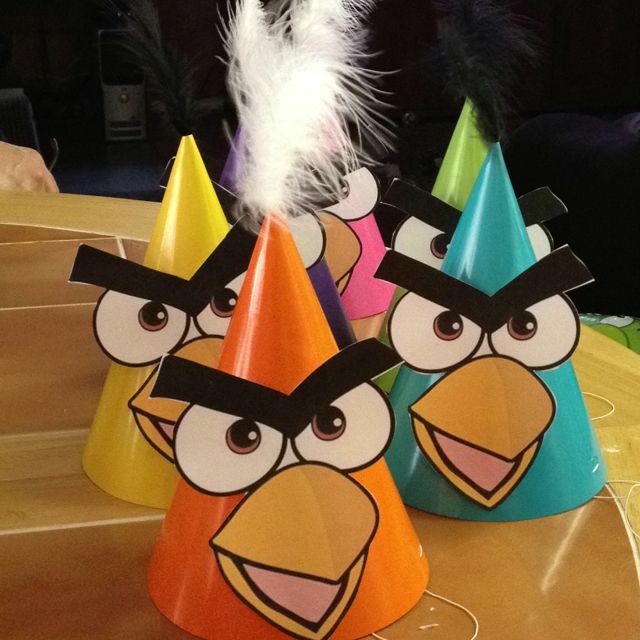 It’s as simple as print and paste and you have these unique Angry Bird Party Hats. Watch those balloons POP as the kids play this insanely fun game of Pig Pop Balloon Darts. This Angry Bird Pinata is almost too adorable to smash, but I’m sure the kids will enjoy swinging and smashing it up. Making these Angry Bird Pom Poms will definitely put a smile on your sweet kiddos face. You can play with them, make a game with them, or decorate with your Pom Pom birds and pigs. I bet you could win #1 mom with this awesome DIY Angry Bird Hooded Towel. They are super cute and really not that hard to make! Check out the full tutorial and get ready to be the worlds coolest mom with this DIY craft. Giving your juice bottles an Angry Bird Face Lift is so simple. With just some paper, paste and Kool- Aid you’ve got a fun unique drink for your party.